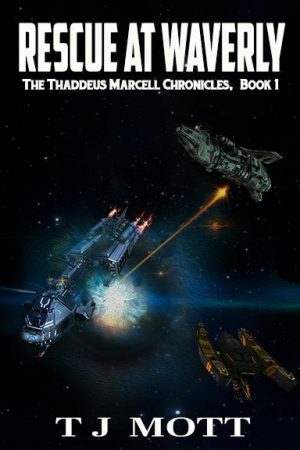 Years ago, Thaddeus Marcell was abducted from the lost and legendary world Earth. Now a mercenary, he fights for the various star empires in the galaxy, all while searching for rumors and clues to Earth’s location so he can return home. It’s been a long, fruitless search. Science fiction is my favorite genre of fiction, and I've always wanted to try writing some of my own. I've made dozens of attempts to write science fiction since, oh, junior high school or so. This is the first book in a series of six, using a variety of ideas, characters, plots, and locations that I've daydreamed up ever since I was a teenager. Originally, many of my main characters are based on amplified aspects of my own personality, which makes it easier for me to write from their perspective. I'm relying on this less and less though, as I gain experience as a writer, and now I spend a bit more time trying to come up with characters that clash with others or cause problems, versus designing characters that are easy for me to write. Thaddeus Marcell looked up from his work and glanced at the surface of his large faux-wood desk. One of the touchscreens embedded into the tabletop displayed details about the comm channel which had just opened. It identified the speaker as an Ensign Paice, comm officer on duty in the ops center. The comm issued a soft double-chirp, indicating that the channel was closed. Thad rubbed his tired eyes for a moment and reached for the glass tumbler on his desk. It was half-full of a dark brown liquid. A few smooth stone-like remnants of ice cubes floated at the top. He finished its noxious contents in one long gulp, feeling the fumes sting within his nostrils for the next few seconds as the familiar sensation of fire forced its way down his throat. He stood and turned to look out the huge picture window which took up almost the entire exterior wall of the room behind his desk, though there was very little to see. Headquarters was an orphaned asteroid stationed quite literally in the middle of nowhere. The nearest star, almost ten light-years away, provided only negligible lighting to the asteroid. Also, the base was in the middle of its simulated night cycle, so the majority of the asteroid’s inhabitants were asleep and nearly all lighting was dimmed or offline. As he looked outside, he could only make out a few nearby details illuminated by the office windows of a few other late workers, and the barren surface of the asteroid quickly became invisible as his gaze moved farther out. An airtight walkway anchored to the rock glowed dimly from within as it traced out across the asteroid, linking the ops building to the nearby residential dome which itself was mostly darkened save for the light poles that surrounded the pedestrian walkways between buildings. Years ago, Thaddeus had towed the asteroid out into the part of the galaxy known as the Independent Regions and built it into a secret command center for his organization. The Independent Regions were hundreds of light-years away from any of the galaxy’s major empires, and remained relatively uncharted except for the areas immediately around the populated systems scattered within, making it an excellent place to hide. Few people knew his Headquarters existed, and only a handful knew its precise location. The chances of anyone accidentally stumbling upon it were essentially nil. He checked the old-style analog clock he kept on his wall. 0200 local time. He really wished he’d been able to sleep. On the other hand, Commodore Cooper was one of his few subordinates that he got along with well on a personal level, so Thaddeus welcomed the opportunity to greet him as he returned from his missions. Thaddeus tapped a button on his desk, locking his workspace and preventing anyone else from accessing its systems, and left his office. He entered the hallway, passed a lift, and instead took two flights of stairs down to ground level. Within minutes he was in a walkway tube on his way to Hangar 5. The Headquarters asteroid had numerous buildings and domes anchored to its rocky surface, all interconnected by a network of airtight walkways. A few nodes also acted as hubs for an electric rail system, allowing quick travel and bulk cargo movement between major areas. But unless he was in a hurry, Thad liked to walk. At 0200 in the morning, he had the path all to himself. The walkway was dim, with just enough light to safely find one’s way, yet still dark enough to suggest nighttime. Hangar 5 was nearby, only a few hundred meters from the Ops Building where the bulk of his organization’s administration was handled. The walkway was lined with windows, allowing him to look out at the dark, desolate surface. The complex was built upon a relatively flat plain, although the asteroid was small enough that even its flat spots were noticeably curved. The steep cliffs and mountains which surrounded the base were all but invisible, providing only a sudden, jagged horizon where the starfield abruptly ended. As he neared the hangar, Thad looked up to see the running lights of an approaching transport in the sky, though not with enough detail to identify it. Anyone not accustomed to the solitude and darkness of Headquarters would find the sight eerie. Above him, the ship was a silent constellation of blinking lights with no distinguishable form connecting them to each other. Only the growing mass of blotted-out starfield suggested that the lights were in fact part of a larger, unseen object moving through the darkness. He passed through the end of the tunnel and entered the hangar building itself, finding himself in the building’s support wing which contained a few darkened offices, storage closets, environmental systems, and so on. He continued on through the hallway and pushed through a large double-door that led to the hangar deck. It was a smaller hangar, chosen for its close proximity to the Ops Building rather than its storage capacity or throughput. The large rectangular space inside was designed to receive and store some of the smaller vessels used by the highest-ranking individuals in Thaddeus’s organization. The hangar smelled slightly of grease and oil and stale, reprocessed air. Apart from the crew waiting to receive the Commodore’s transport, it was completely deserted, as could be expected at such an hour. Several small transports were already landed and stowed, as well as a few of the popular Cutlass-class fighter-bombers that many of Thad’s officers liked to use as personal short-range transports. One of them was half-disassembled, a semicircle of hull panels, LRUs, and tools scattered on the deck around it. Its fusion core sat in a maintenance cradle a few meters away with a bundle of cables running out to a nearby rack of diagnostics equipment which blinked out regular patterns of light as it performed an unattended overnight test sequence. And a pair of the sleek but diminutive Dart-class recon fighters hung suspended from storage racks on the ceiling, accessible via the network of catwalks which crisscrossed the topmost portions of the hangar. Thaddeus stood just inside, near a few holotables installed by the wall as an ad-hoc on-deck break room. The entire north-facing wall of the hangar was one single massive airlock door. Thaddeus listened to the sibilance of air pumps as the airlock pressurized itself to grant access to the incoming transport. The inner door began sliding open, creating a momentary pressure disturbance which popped his ears. The doors then issued a brief hiss which soon gave way to a steady mechanical grind. As the doors lazily slid on their tracks and receded into the walls, they slowly revealed a squad-sized transport which balanced carefully on the violet tongues of superheated plasma that emitted from its downward-facing thrusters. The bright cones of ionized exhaust stirred up the still air, bringing the hot smell of ozone to Thaddeus’s nostrils. The inner doors finally reached the end of their tracks and locked open with a massive clunk that reverberated through the hangar for a number of seconds. Afterwards, the hangar fell into relative silence, a quietness broken only by the gentle, torch-like thrum of the ship’s thrusters. An ear-splitting roar rang out for a brief moment as the transport fired a quick burst of its main thrusters, sending it creeping forward into the hangar. As it cleared the airlock, the inner doors restarted their slow, grinding crawl which eventually sealed the opening between the airlock and the hangar interior. The ship expertly glided through the air, following the ground crew’s gestures as they directed it to an empty bay recessed in the wall across from Thad. It touched down and settled on its landing struts, and as soon as the thrusters went silent the crew burst into action. One of the men rolled up a waist-high cart of electronics and plugged into a data port on the transport’s nose. Another fetched a fuel hose from the bay’s refueling system, hooking it up to the underside to top off the pressurized deuterium tanks which fueled the craft’s fusion reactor. Another hooked up the bulky air hose which provided ventilation for the transport, allowing it to shut down its life support systems. Others began slowly circling the landed ship, performing a detailed visual inspection while filling out travel and maintenance records on a tablet. Finally, the transport’s side ramp opened up and the Commodore himself walked down to the hangar deck, followed by his executive officer and a few other individuals. They briefly chatted with the ground crew, laughed about something, shook hands, and split up. The man scanned the room, and upon locating Thad he began approaching. Commodore Cooper was a middle-aged man of about fifty standard years, below average height, with short salt-and-pepper hair. As usual, he was dressed in the nondescript dark gray trousers and jacket that unofficially passed as a uniform for Gray Fleet personnel. He was well-built, having surprising strength and agility from decades of combat and martial arts experience. He was wily and astute, with nearly thirty years of experience in espionage, and served as the commander of Thaddeus’ intelligence and recon fleet, known as Gray Fleet. He’d been making the local rounds for a few months now in his flagship, an aging, nondescript frigate called the Phantom, quietly visiting nearby star systems and space stations to gather news and reports from his agents. This was one of his regularly-scheduled trips home to report in, check for new orders, and exchange crew members if needed. Cooper made a hurt face. “Home?” he responded in his raspy baritone voice while shaking his head dismissively. “I still don’t see how you call this lonely rock home.” He took a seat at the nearest holotable, and Thad joined him. “It’s way too boring here. I have to work too hard to keep myself entertained. There’s no racetracks, no black market, no gambling halls!” he exclaimed with mock indignation. “Oh yes,” said the intelligence chief. He fiddled with the table’s computer system and a few moments later a projection of a ship hovered between them. Cooper kept his eyes focused on Thad and said nothing, grinning, waiting for him to look it over. It was clearly a starship, but there wasn’t much detail to it. It was a smooth, rather nondescript cylinder with a trio of fusion drive nozzles on the rear. It tapered to a cockpit or bridge at the front. That’s what made him a good intelligence chief. If he saw something interesting, he’d take it just to add to the organization’s knowledge and technology. It fit in nicely with Thaddeus’s goals. “So besides being fast, what else can it do?” Thad asked. Thad furrowed his eyebrows. “It doesn’t look that small,” he decided, although he realized there wasn’t enough detail in the image for him to get a good sense of scale. “Still trying to read everyone’s mail, eh?” Hyperspace transceivers did exist, using a strange form of energy known as phi-band radiation, but the devices were limited in range to about a light-year for the high-powered units. Some of the closer and wealthier star systems had expensive networks of phi-band relay stations stretched between them, but most communication was sent around the galaxy via courier ships. Thaddeus whistled again. “Fifty mil?” Cooper nodded. “That’s good retirement money,” he joked dryly. Cooper’s expression soured into a stiff grimace. “Marcell, he’s not like us. High Prince Saar is a dangerous man, and he’s probably not sane anymore. Next time you go out there, watch your back, okay? With a bounty that high, you might have a lot of people looking for you.” He paused to chew on his lower lip. “Maybe even from within the organization,” he said carefully. “You too.” Thad winced as Cooper gave him another mock salute. Despite his title of Admiral, his manner was far from military. His organization wasn’t a military attached to a nation-state, it was an independent mercenary force, and so protocol was usually pretty lax.